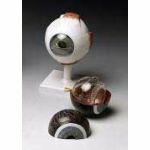 This normal oversized eye model includes four (4) interchangeable corneas that show various cornea conditions including Bullous Keratopathy, Fuch's Endothelial Dystrophy, Keratoconus and Normal. 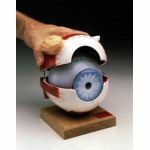 Model size: 5" x 3" x 4"
Suitable for Ophthalmology, Optician and general anatomical study, training for surgical dissection, sports medicine, or for patient education or demonstration of procedures. Brand new. In original factory packaging. Made of a durable, plastic material accurately designed and colored to represent the major structures and, in certain instances, lesions or other abnormalities as described above. Includes sturdy and attractive display stand and detailed instructional card..